That I knew that one day I’d really have to do. And finding somewhere in the town a quiet cobbled square. And no-one was about, except some children playing there. In that quiet and sleepy village in the depths of Italy. Like, why was I intruding in someone else’s life? I think it was the curious looks the children threw at me. So now, a long time later, I’m back in that small town. It’s more or less the same, still sleepy, quiet and hot. There’s the same feeling of – what am I doing here? But I can travel where I like, so I don’t see why not. Well, I’ve found a cobbled square with a fountain at one end. Maybe that was it, but I can’t really say for sure. But am frankly too exhausted to keep looking any more. Or perhaps it was nearby, down a turning that I missed. 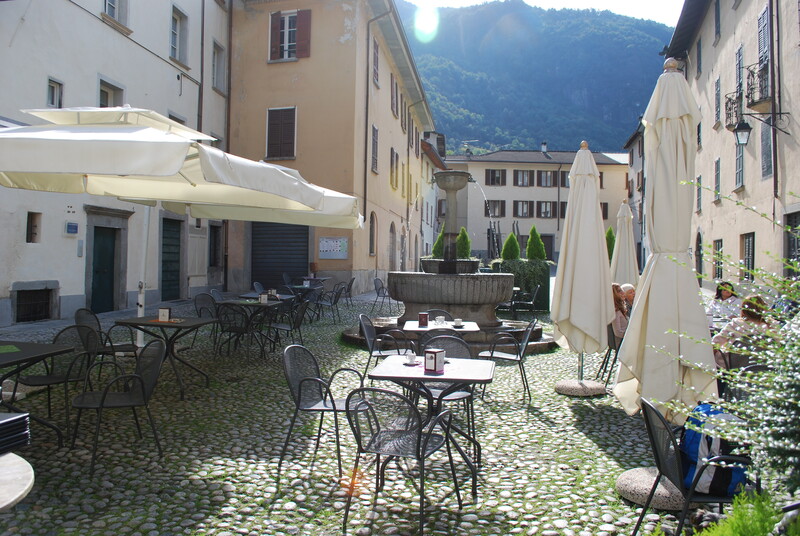 And my square in Chiavenna didn’t ever exist.